During the week of January 27th, 2014, there was a snow storm that blanketed the southern states leaving 2-4 inches of snow with ice. This storm left the states affected in shambles. It felt as if the apocalypse was upon us. I didn’t drive until Thursday morning – the worst of the storm was Tuesday night into Wednesday. I didn’t drive because I didn’t have to. I keep my house in a state of preparation for such a storm. I keep my house stocked with enough food for a week, at all times, in case of a storm like this or another situation that makes it unfeasible or unsafe to get to a grocery store for the necessities. Thursday morning was an eye opener for me. It was the first time I had been on the road in the southern states after such a storm. I’m a driver from the northern states where snow is a common occurence. I have a lot of experience driving all sorts of vehicles in snow and on ice. I have driven in conditions that most people wouldn’t believe. While I hesitate to say I have mastered the science and art of driving in inclement weather, I have no fear of driving in any condition if I have to drive in such conditions because of my experiences and skills. From my experience, after what I saw driving that Thursday morning, I felt obligated to provide the following tips, facts and advice on driving in snow and ice. Please read it all and think about it. Digest it. It is both enriching and respectful. If one driver uses the advice below and that knowledge prevents and accident, then the article was worth it. THE GOLDEN RULE: If you don’t have to drive, don’t. You don’t have to go to the movies. You don’t have to go out to eat. You should only drive if someone is dying and an ambulance cannot reach you in time or if you will lose your job or someone will die if you do not drive. There is nothing wrong about driving safely or with caution. If you have to drive at 45 MPH on the highway to feel safe, do it. You shouldn’t feel pressured to drive in a manner that makes you feel unsafe or uncomfortable by other drivers. Stay in the right most lane that you can and let them go around you – DO NOT stay in the left lane if you can stay in the right lane. Stay right except to pass! If you choose to drive safely or with caution you must drive that way the entire time you are driving. You cannot choose to drive safely when you see snow or ice 100 feet in front of your vehicle. Having 4-wheel drive, a 4×4, all wheel drive, winter tires, or a large truck does not make it any safer. Your tires will still lose traction on ice just like everyone else. Those types of vehicles might do better on snow in low-speed situations. They will not help you on the highway when you hit a patch of watery snow and start hydroplaning. Be easy on the pedals. Gas and brake. Slamming on your brakes at the sight of ice or snow on the road will only cause you to slide and causes accidents. Accelerating too fast will also cause you to slip. 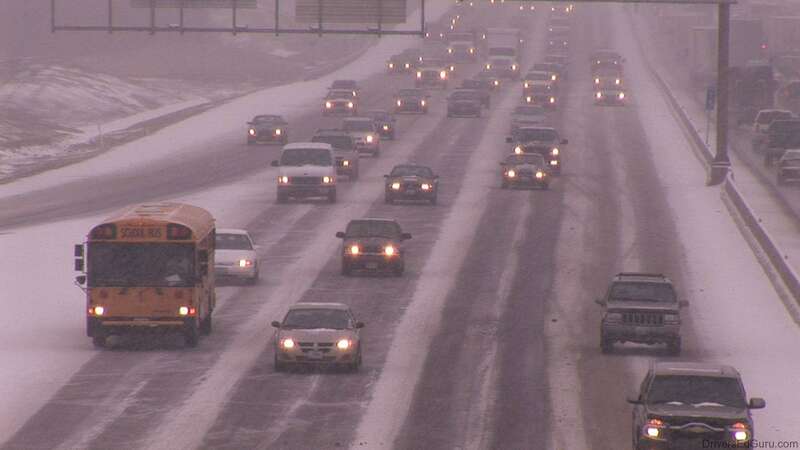 Your vehicle needs more distance to stop on snow and especially on ice. While you may not be slipping, braking on snow or ice causes your wheels to slip a little bit which makes you lose speed at a slower rate, requiring more distance to stop. If you feel the need to slam on the brakes at the sight of snow or ice, you are driving too fast. Consider slowing your average speed down so that you don’t have to slow down. Slamming on your brakes, especially in traffic or on the highway is the leading cause of those nasty pile ups. The human factor is the cause. You slam on your brakes causing the person behind you to do the same. This is a chain reaction and each time someone has to react, it adds their reaction time on top of it, decreasing the amount of time each consecutive driver has to respond and slam on their brakes, eventually causing a chain reaction resulting in a pile up, or in the best case a few fender benders. You don’t need to slam on your brakes for snow on the side of the road or down the middle of the road where your tires will not run over. The highway is probably the safest of all roads. Due to the traffic, the road surface is actually warmer than the air and the water doesn’t have as much time to freeze up because it is constantly being run over and moved by wind from passing vehicles. It is also the first road that will get salt and sand on it from the covering municipality. Unsalted water will freeze at 32 degrees. It freezes faster at lower temperatures. When a road is salted, the average freezing temperature of water on it drops to as low as 19 degrees Farenheit. Road surfaces on bridges freeze faster because they do not have the earth underneath them to insulate them against the cold air. Road surfaces in windy areas freeze faster due to wind chill faster. Water can flash freeze if a large or fast gust of wind hits it. It is advisable to keep your front windshield defroster blowing on your window at all times to counter this, just in case. Downshift and use the brakes when you are trying to slow down. You will slide less. Yes, you can do this with most automatics. Shift down from “D” or “O” to “3” or lower. Prefer “D” over “O”. My car goes from D to 3 to 2 to L, effectively letting me force downshifting from 4th to 1st gear. Use a lower gear when climbing hills. You will slide less. In the vast majority of cases, when your car slides on ice it continues to move in the direction that it was moving before it started sliding. If you hit ice on a straight road, do not panic because if you were going straight, you will continue to slide straight down the road and hopefully slide straight until the end of the patch of ice. It takes more than one wheel on ice to start sliding. Single patches of ice that are small enough for only one wheel of your vehicle to touch at a time will not cause you to slip. If you do start sliding, remember to be easy on the pedals and steering wheels. Panicking will only make it worse. If you see ice ahead, look beyond the ice in your path of travel to see if it clears up. This helps you prepare your route within the time (dictated by your speed. Less speed = more time to react!) you have before you hit the patch of ice. You should also let off the gas and do not slam but very gently press the brakes. Downshifting also helps without the risk of locking up your wheels. Get an ice scraper with a brush for your vehicle. Keep it in your house when you are home and bring it in with you to work when you are at work. Take it out with you to your car each time it snows. Clear your door enough to get in and start the car – turn your defrosters for your windows on a medium blower setting with high heat (higher blower settings can cause your car to take longer to warm up in lower temperatures). While it is heating up, scrape your windows, all of your windows, brush the snow off of the hood, roof and trunk of your car and off of your head, tail and signal lights. Before a snow storm, pull your windshield wipers away from the vehicle to prevent them from freezing up. Frozen or ice-covered windshield wipers do you no good. Use windshield washer fluid instead of water. Windshield wiper fluid will still eventually freeze but it freezes at a lower temperature. Keep a jug of windshield washer fluid in your car or house in the event that the windshield washer fluid reservoir or lines do freeze up or the spray nozzles get clogged with ice, salt or sand. You will need the fluid to wash salt build up from the spray on the highways if they are salted. It dries quickly and obscures your vision very quickly. If your washer fluid does not work and you have no way to clean off the windshield, pull over and use snow. Always have a pair of warm gloves and sunglasses. The gloves to keep your hands comfortable if you have to brush snow off of your vehicle or use snow to clean off the windshield and the sunglasses because snow and ice reflect light causing the sun glare to be really bad. Cat litter is great to have in your trunk. If you get stuck on a patch of ice in a parking lot, you can sprinkle it on the ice to give your car traction to get out. Play sand is another great alternative. A folding shovel is also good to have in your trunk. Use it to dig your car out of snow if your tires get buried in the snow. A tow strap can help, too. Put one in your trunk. If you get stuck you can ask another drive to help pull you out, or vice versa! If the storm is going to be really bad, long, or extra cold, put a few blankets in your trunk and a few days of food and water. Just in case you get stuck somewhere and have to sleep in your car, you can use your blankets to keep warm in the car. The food and water are in case you get stuck there for a few days. It happens more than you would believe! If you found this useful, be sure to use the share buttons at the top of the article!